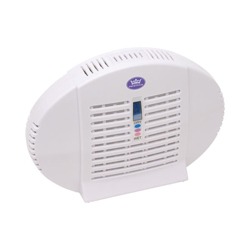 The Premiair RMDH-09 is a mini rechargeable dehumidifier ideally suited for use in a cupboard, closet, wardrobe, car or other small, enclosed space. The RMDH-09 is a more sophisticated version of the little white bags of silica gel that you find when you unpack newly purchased items such as computers, binoculars and shoes. Silica gel is a desiccant, a material which has an affinity for water. The desiccant captures individual water molecules and in an enclosed area this dries the air and keeps it dry. This type of dehumidifier does not have moving parts and does not even need a fan, let alone a compressor. Water vapour behaves in a way similar to air. If relative humidity is reduced in an area some of the remaining water within the enclosed space is drawn to the less humid region to "equalise the pressure". Thus the desiccant can trap water indefinitely as the water molecules it captures are replaced be those drawn from more humid areas to be trapped in their turn. The desiccant will continue to trap water until there is little or none left and only stops when it becomes saturated. This is where the "rechargeable" part comes in. The means to dry a desiccant is to apply heat. By plugging the Premiair RMDH-09 into a power supply, like charging your mobile phone, the electric current provides heat which energises the water molecules and allows them to escape from the "trap". If you would like to share your own experiences of using the Premiair RMDH-09, or any other dehumidifier, please click here to tell your story. The Premiair RMDH-09 does not have a quoted water extraction rate but evidence from users indicates that one of these units will be effective in a drawer or a small to medium sized wardrobe. In a larger wardrobe or a car two units may be necessary. Obviously this type of dehumidifier will have no impact on even the smallest room in the home but a unit placed on a window sill, with the curtains closed behind it, will reduce or eliminate overnight condensation, unless the room as a whole is damp. Most users find that the RMDH-09 will need to be charged about once per month. The desiccant in the RMDH-09 is in the form of glass crystals and it will be obvious when recharging is required as the crystals turn pink and can be observed through a sealed window in the unit. It is helpful to bear in mind that when the unit is recharged the collected water will return to the air so it is advisable to recharge in a reasonably open space within the home, with some ventilation if possible. There are several advantages to the Premiair RMDH-09. It is that rare animal among dehumidifiers, a completely silent unit. If you are using it to keep a wardrobe dry in the room in which you sleep it will not keep you awake. The unit is very compact measuring 20.0 x 6.0 x 15.5cm. Small as it is it may surprise some users that it is not smaller still. The size of the unit has to be large enough to accommodate sufficient desiccant crystals to be effective. Even so the RMDH-09 will fit comfortably into most tight spaces. There is no water to empty from the unit so no water collection container or drainage hose. This is far more convenient for use in a car or a closet than other types of dehumidifier. The RMDH-09 does not need a permanent supply of electricity so there is no need for a power cable when the dehumidifier is in use. Once again this is an advantage in a closet or drawer and, particularly, in a car. The RMDH-09 is not affected by low temperatures, as refrigerant dehumidifiers are, and will operate effectively even in near freezing conditions. This benefit will be valued most by those who wish to use one or two of these dehumidifiers in a car. One other advantage of the RMDH-09 is that it is cleaner and easier to use than the only viable alternative, open tubs of silica gel or another desiccant. Such tubs are always at risk of being overturned by accident and when the desiccant is wet are subject to mould formation. The desiccant can be regenerated, by heating in the oven, but the RMDH-09 is an altogether more convenient and neater solution. In summary, the Premiair RMDH-09 is an ideal product for use in small, enclosed spaces. It is relatively inexpensive, has no moving parts to fail and may be used in areas where other types of dehumidifier could not or, if they could, would be far less convenient, and noisy.